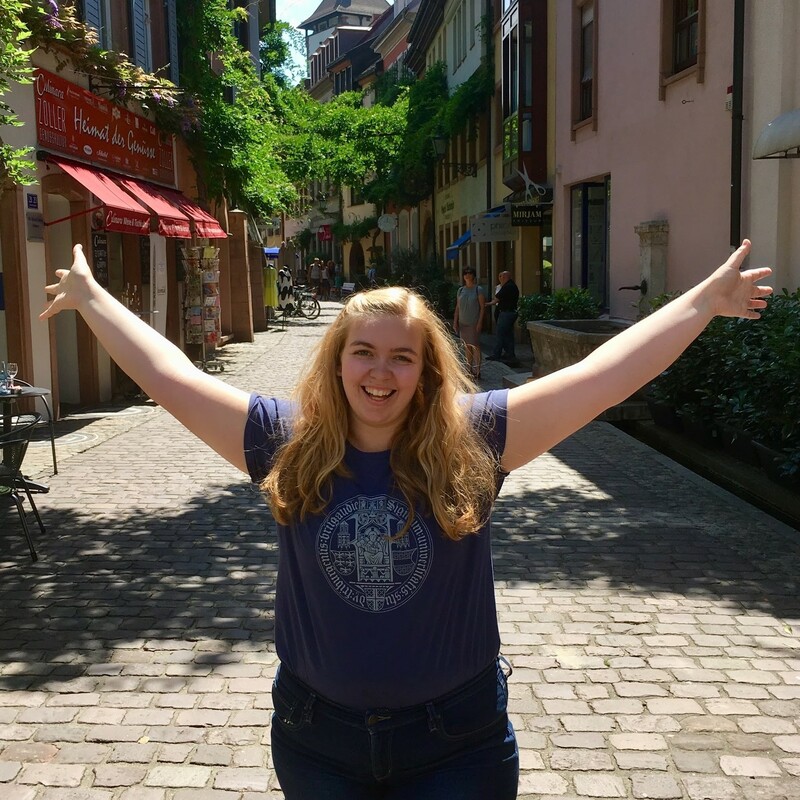 I had always wanted to incorporate a study abroad experience in Germany into my undergraduate studies, so it was only a matter of finding the right program and the right time. A lot of people say that studying abroad can be “life-changing,” but for me it was more of a life-confirming experience. Studying abroad helped me to see that I am following the right path to achieving my career and life goals. Since I am a pre-med student, any science classes that I could have taken abroad would not have been accepted by U.S. medical schools. I instead decided to focus my semester on earning credits towards my German major. The Freiburg program offers a wide variety of courses at multiple institutions to choose from. I took at least one class at each institution and all courses should be able to fulfill requirements for either my German major or Baccalaureate competencies. A lot of people say that studying abroad can be 'life-changing,' but for me it was more of a life-confirming experience. The first day I arrived was one of the coldest days in winter, so all I could initially think about was how freezing it was! Although it was cold outside, the on-site staff did not fail to give me a warm welcome to Freiburg. After starting a pre-term German language course, I really enjoyed getting to know other international students and exploring Freiburg and the region. I stayed in a student apartment with 11 other university students, about half Germans and half international students. We each had our own room, but shared a kitchen and a few bathrooms. The apartment complex had a very nice park with a lake outside, where I enjoyed hanging out with friends on nice summer nights. I took all courses to count towards my German major, including a politics class and a literature class. While studying abroad, I really wanted to take at least one class that I wouldn’t be able to take at home, so I chose a class on music and media during the Nazi period. It turned out to be one of my favorite courses! I knew that studying abroad would be expensive, so I started applying for scholarships a whole year before my expected program term. IUPUI had lots of great scholarships to offer for study abroad, and I managed to get my experience fully funded! While abroad, I made sure to make a budget and keep track of my expenses, so I didn’t spend more money than I had allotted for my program, personal expenses, and travel. Freiburg is in the perfect location for traveling, since it’s located less than an hour away from both the French and Swiss borders! Europe has a lot of great cheap travel options, including transportation by bus and train and lots of youth hostels. During the semester, I travelled to several cities in Germany for weekend and day trips as well as to many other European countries, including Italy, France, Switzerland, Austria, and the Czech Republic. Freiburg is also an amazing city with lots to do and is located in the Black Forest, so there are many outdoor activities to do and sites in the region to explore! I mostly conversed with students and faculty as well as local businesspeople at the market or restaurants. My German is good enough that most people couldn’t even tell that I was an American! If I did reveal that I was an American, they were still very friendly and welcoming and occasionally we exchanged information and opinions about our different cultures. I confirmed that my mindset is very similar to most Germans and that we were all open to learning new things and tolerant of our differences. Your study abroad experience is what you make it! I thoroughly enjoyed traveling, making friends with other study abroad students, exploring Freiburg, and joining a student group. Looking back, I maybe would have joined more student groups and tried to make more friends with German students. Continue to do the things you love while abroad and try new things too! Since the age of 5, I’ve always wanted to become a surgeon. My study abroad experience did not change my career goal, but rather confirmed I should continue following the path I’m on. I had been thinking about going to medical school in Germany or practicing medicine there, and I got to talk to both a medical student and a practicing doctor while I was abroad. I learned much more about the German medical system and now I have the information I need to make a more informed decision about my future. I’d love to pursue a career as a surgeon and be able to use my German language skills as well as be able to see the world at the same time. Now, I’m very highly considering joining an international medical service organization like Doctors Without Borders!